The Dipo rite is a puberty rite performed by a few Dangme Groups – namely the Shai and the Krobo. It is a rite that transitions a female from Childhood into Womanhood. In both the Shai and Krobo communities going through the Dipo rite is a prerequisite in becoming a woman who is capable of fully participating in the community, being a wife and having a family. In Ancient times those who did not do it or got pregnant before the Dipo rite was done were considered outcasts – some banished from the community. During the performance of the Dipo rites the Woman is spiritually cleansed – in the case of the Krobo the God Nana Kloweki is the main God called upon. The initiates would be aged between 10-14 and the rite traditionally could take up to three years of which the girls had to remain on the Krobo mountain. In 1892 Govenor Griffiths sent out a Native Customs ordinance which expelled the Krobos from the mountain and banned the practice of Dipo. It was not until several years later that Konor Emmanuel Mate Kole introduced the modified version of Dipo as we know it today – which takes around 7 days to complete. The rite is usually performed by those who are of age (early mid teens) however in recent times one can see children as young a two taking part. During the Dipo process the initiate is not supposed to do any hard labour and must use her attention to learn the lessons in which the elder women would be teaching her. The initial part of the Initiation is to ensure that you are worthy enough to carry out the tradition i.e. you are not pregnant, or have not had an abortion. The first few rituals are to draw out these things. This is one of the few parts of Dipo that is carried out communally rather than per family house. On arrival at the sacred place where the sacred stone is located, libation is poured to Nana Klowɛki (Diety) and the Ancestors. Once the libation is done, each initiate is made – with the help of the priestess- to sit on the stone three times. If the girl has been or is pregnant the idea is that it will be revealed and she would not be able to get up from the stone. The antelope is said to have a special relationship with the deity associated with Dipo – Nana Kloweki. The initiate is therefore made to stand on the Antelopes skin three times. Again any issue with the initiate that will not allow her to take part in the Dipo will be revealed. The initiate has to be stripped of who she was before in preparation of the transition into womanhood all of these actions are carried out by elderly women in the house. During this time the Dipo initiates are not allowed to wear any footwear. 1) They cannot drink pipe borne water except on the Monday Niwomi ceremony. 2)They are not allowed to eat foreign foods such as Peanuts and Roasted Maize. 3) They can only eat typical Krobo foods such as Alamua (called ‘water yam’), hyɛ (white guinea yam), Plantain, Wuwui etc. Further rituals take place where initiates will visit the shrine, Klama songs will be sung, and the girls will have a period of time away from the community where they are taught about the Krobo way of life. 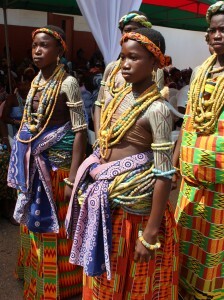 At the end of their rites, they will be dressed beautifully and paraded around the town as Worthy Krobo women.